In USAID’s—and the world’s—goal of ending preventable child and maternal deaths, the faith sector is a powerful partner. Close to 90 percent of the world’s people adhere to some religious belief, and in rural areas in many of the developing countries in which we work, health care is provided by religious organizations. Faith-based organizations like the Christian Health Association of Malawi (CHAM) reach deep into the community, and bring a unique set of skills, experience and contributions to the development arena. They play a pivotal role in improving the quality, accessibility and respectfulness of maternal and child health services—and in promoting the demand for these services. Many faith-inspired groups are enthusiastic supporters and invaluable allies in our efforts to save the lives of mothers and children. Take the Ndirande Health Center in the city of Blantyre, Malawi, where 15 students from St. Joseph’s College of Nursing and Midwifery work alongside clinical staff to check the vital signs and collect the histories of women who have come to give birth. They assist during the deliveries, and administer necessary care when emergency situations arise. Recent visitors to the hospital have been pleased that their waiting time has been reduced, as the students, organized into teams, quickly and efficiently check people in and get them the care that they need. As the only public health facility in a district of more than 300,000 people, there is never a dull moment at Ndirande. On the other side of Blantyre, at the Chilomoni Health Center, 19 of their classmates perform similar duties. Both facilities see upwards of 300 deliveries a month; at Ndirande, that number sometimes approaches 450. On average, 10 or more women come to each facility to give birth each and every day. For the nursing students at St. Joseph’s, the challenges and experiences that they face at the health facilities are an invaluable learning tool. And for the clinical staff, the extra hands on deck provide much-needed assistance throughout the busy days. 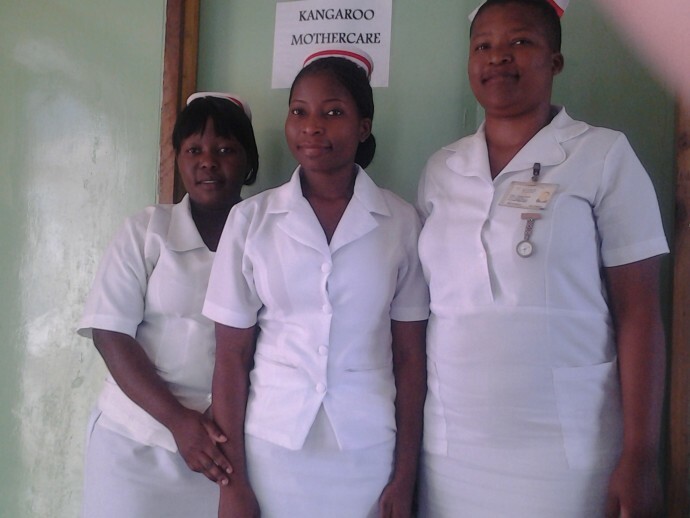 At Chilomoni, the hospital’s staff is more than doubled by the addition of the students. St. Joseph’s is one of 12 constituent training colleges funded in part by USAID and operated by CHAM. Established in 1966, CHAM is an ecumenical organization overseen by the Episcopal Conference of Malawi and the Malawi Council of Churches, and provides administrative and technical support to the health care services of member units across the country. With 175 member health facilities, CHAM reaches more than 4 million Malawians with health services—37 percent of all care provided in Malawi, and second only to the Ministry of Health. Through training programs like those at St. Joseph’s, students are able to become nurse midwife technicians, medical clinicians, laboratory technicians and psychiatric nurses. This training helps students bring knowledge and experience to Malawian communities—and is an important step towards ending preventable newborn, child and maternal deaths. Chimwemwe (“Joy” in the local Chichewa language), a community health worker in Malawi, meets with an HIV-positive pregnant woman at her home in Lilongwe through the USAID-funded Tingathe program, which works closely with the Ministry of Health. / Chris Cox, Baylor College of Medicine Children’s Foundation. In the 2014 Acting on the Call report, USAID laid out a framework for using proven, high-impact interventions and data-driven investments to improve health outcomes in 24 priority countries for maternal and child health, saving the lives of 15 million children and 600,000 thousand mothers through 2020. In Malawi, a scale-up of key interventions could save more than 25,000 newborns and 5,000 mothers—lives that we know how to save, but that will likely be lost if we do not act. Already, our efforts are yielding results and translating into lives saved. The 2015 report shows that Malawi is on track or has exceeded the year’s target for improving key interventions, such as the percentage of live births occurring in a health facility or being overseen by a skilled birth attendant, or the percentage of households with at least two insecticide-treated bed nets. But more rapid progress is needed in pregnant women receiving antenatal care and in women and children having access to clean water. Our collaboration in Malawi with CHAM is one of many ways we are leveraging strategic partnerships, promoting country ownership and building the capacity of local communities. The holiday season reminds us how vital these partnerships are—now, and all throughout the year. As the students at St. Joseph’s graduate next year, we will be there applauding them for their hard work, wishing them future success, and welcoming in the next class of students to begin their training. Katie Taylor is the deputy Child and Maternal Survival Coordinator and a deputy assistant administrator for the Bureau for Global Health at USAID. Check out more of USAID’s work in Global Health, Maternal and Child Health and Maternal Health. Read the success story about USAID’s work to promote facility births in Malawi. Browse the photo gallery of USAID’s efforts to end preventable maternal mortality.